Aharon Karov, seriously injured in Operation Cast Lead, shares his thankfulness over running NYC Marathon after miraculous recovery. 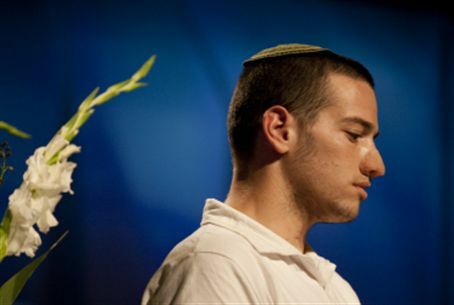 Aharon Karov was grievously wounded in the line of duty during Operation Cast Lead in 2008. He recently wrote a letter express his thankfulness, after his inspirational and miraculous recovery allowed him to run in the ING New York City Marathon this last Sunday. In 2008 Karov was called up for army duty in Operation Cast Lead the morning after his wedding. In the line of duty was seriously injured by a Hamas booby-trap which left 500 pieces of shrapnel in his body. Early predictions anticipated that he would not survive, but Karov went on to achieve a miraculous recovery. On November 3 he was able to take part in the 26.2 mile Marathon that NY Daily News reports drew a record number of more than 50,000 runners. There Karov beat the time he had hoped for, finishing the race in 4 hours and 14 minutes. In a thank-you letter to the OneFamily Fund, a group that has received recognition in aiding terror victims, Karov wrote "I have been on a very difficult journey over the past five years - I learned that between recognizing the miracles from G-d and relying on the support of family and friends, every journey is worth taking." Karov further wrote about the feeling of accomplishment he felt after running the race. "It felt exhilarating to choose to run the marathon, set a goal worth achieving, and accomplishing that goal through tremendous effort." Karov ran to raise donations for the OneFamily Fund. In 2010 the organization similarly sponsored two brothers-in-law who were victims of terror in running the New York City triathalon.